First published in 1991, Ecología Política is an international bi-annual Spanish-language journal that focuses on ecological debates with special attention paid to environmental and political conflicts. The current issue (48) has just been published under the title: “Cartografía y conflictos. Herramientas para resistir, movilizar y construir” (Cartography and conflicts. Tools to resist, mobilise and build). 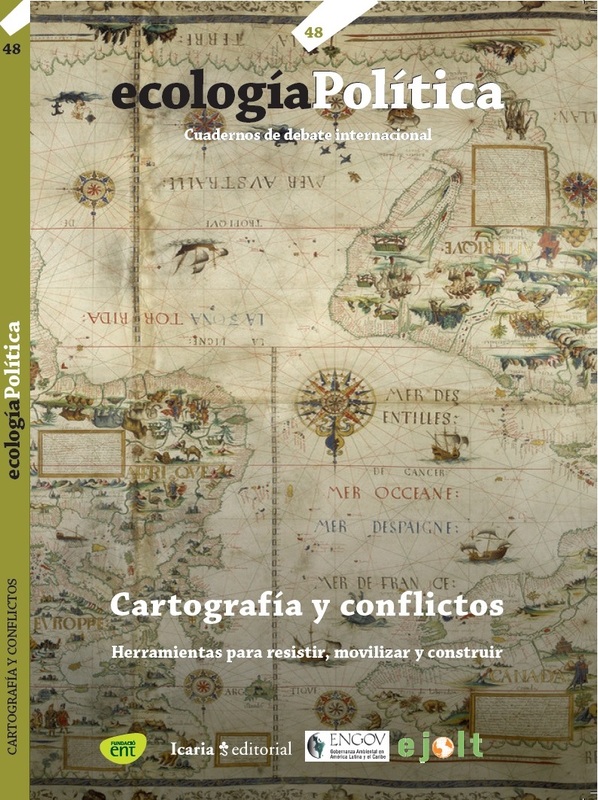 This issue of Ecología Política is organised in seven sections. The first section introduces key concepts from three European projects – EJOLT, ENGOV and “Social Metabolism and Environmental Conflicts” – that were developed between 2011 and 2015 at the Autonomous University of Barcelona’s Institute of Environmental Science and Technology (ICTA), in collaboration with activists and academic organisations. The second section addresses practical examples of using maps for activism, what we call “maptivism”. The third section, geographies of conflict, examines how mapping exercises help to understand environmental and social changes as well as to visualise conflicts at broader scales. In the fourth section, three examples of processes to systematically map conflicts within the EJatlas in Spain, Ecuador and land grabbing in Africa are presented. In the section on networks of resistance, we join the protest against the inaction of political power to climate change in New York. Finally, regarding environmental mentors, key ideas of intellectuals such as Henri Lefebvre, Walter Mignolo and Arturo Escobar are discussed in relation to the power of cartographies. (text adapted from Editorial by Raimon Ràfols). Contents are accessible only under subscription. After one year, they become open access. You can find the previous 46 issues of Ecología Política here. The call for papers for issue 49 of Ecología Política will be published in February 2015. Reblogged this on Bloc de Miquel Ortega Cerdà.